Wishing you health and prosperity and joy ushered in by the Festival of Lights. Had been preoccupied with Deepavali delicacies, remember this is the first time, without my Inlaws and parents, so far had been staying away from kitchen during mission Deepavali, but this time had to take the risk and it was in the end worth taking! Tried posting yesterday but something went wrong while uploading the snap. So delayed wish it is , but true and sincere one at that. Take care and enjoy. 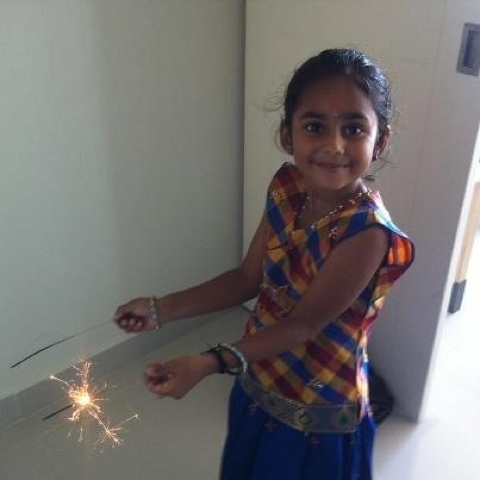 happy Deepavali,it's not too late to wish you and family a happy day.Adithi looks gorgeous in her new dress,did you make it? Health, prosperity and joy for you too! Best wishes for Deepavali.